On Wednesday evening, the recognized Venezuelan pianist Clara Rodríguez performed an innovative repertoire of Latin American classical music at the Bolivarian Hall, the cultural space of the Venezuelan Embassy to the U.S. in Washington, DC. Rodríguez began by describing the great variety that characterizes Venezuelan music. “This program is based on the traditional music of my country, and with a review of composers of great importance. Venezuela has music that ranges across many years and centuries and many styles. Our music is interpreted by universal musicians and that makes me feel proud,” she said. The pieces Rodríguez performed represented more than three centuries of music history, and allowed the public to get a sense of the transformations brought about by each composer. “Today I perform a piece by Heraclio Fernández, a great composer that died in 1886, called El Diablo Suelto, which demonstrates how music remains alive regardless of the passage of time. When this piece was composed it was a waltz, but over time it was converted into a joropo. This shows that despite the years the music will always be alive,” she explained. A large audience gathered at the Bolivarian Hall to hear the pianist, who also played pieces by other famous Venezuelan composers such as Teresa Carreño, who once played for Abraham Lincoln in 1863. The audience applauded her interpretations of works by Manuel Yánez, Federico Ruíz, José María Vettier, María Luisa Escobar, and others. 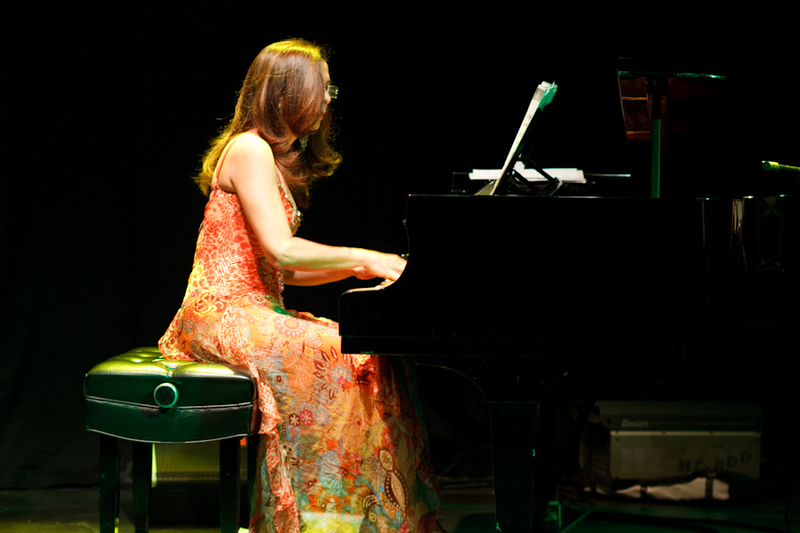 Rodríguez’s experience and talent are part of a family tradition, as her mother also studied piano and encouraged her in her musical pursuits. She has now recorded eight albums of Venezuelan music. Wednesday’s concert was organized as part of Venezuelan Sounds, an annual concert series sponsored by Chevron and hosted by the Embassy of Venezuela to the U.S. since 2004 to share Venezuelan culture and traditions with the U.S. public. 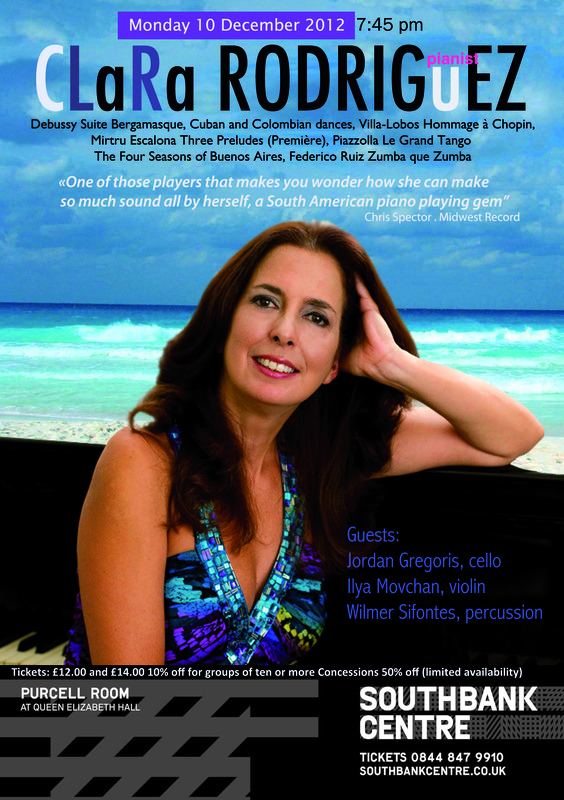 Caracas born pianist Clara Rodriguez is often described as an ambassador of Latin-American piano music, and this concert celebrates South American dances and French influence on the music of the 20th and 21st centuries. In this concert, mixing solo piano works and chamber music, Clara Rodriguez, alongside three guest musicians, performs pieces of music for which she feels special affinity and affection. Beginning with the delicate Suite Bergamasque by Claude Debussy, which includes the famous ‘Clair de lune’, she continues with the London première of Three Preludes by the young Venezuelan composer Mirtru Escalona in which innovative sounds are explored, creating a world of reflection. Mirtru Escalona lives and works in Paris, has won an array of prizes and his music is in much demand worldwide. Clara Rodriguez also gives a performance of Villa-Lobos’s ‘Hommage à Chopin’, an exuberant portrait of Chopin’s poetry and passion from the view point of the Amazonian composer. Two large compositions by Astor Piazzolla also feature in the programme – ‘Le Grand Tango’, dedicated to Mstilav Rostropovich, and the ‘Four Seasons of Buenos Aires’ . These pieces are played alongside the French cellist Jordan Gregoris and the Russian violinist Ilya Movchan. To end the evening Clara Rodríguez plays with fellow Venezuelan percussionist Wilmer Sifontes dances from Cuba and Venezuela, as well as a Bambuco and a Pasillo (London premières) by the Colombian composer Germán Darío Pérez .